Prof.Dr.Gilbert Babin received M.Sc. (informatique) from Université de Montréal and Ph.D. (Decision Sciences and Engineering Systems), from Rensselaer Polytechnic Institute. His Expertises are Information systems modeling, Heterogeneous distributed information system integration, and Web computing. 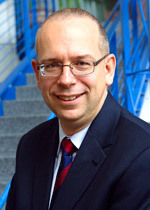 He is currently the Director of the Academic Department of Information Technologies. HAJJI, Adnène, PELLERIN, Robert, GHARBI, Ali, LÉGER, Pierre-Majorique, BABIN, Gilbert; « Toward valuable prediction of ERP diffusion in North American automotive industry: A simulation based approach », International Journal of Production Economics, Vol. 175, Mai 2016, p. 61-70. AUBERT, Benoit A., BABIN, Gilbert, AQALLAL, Hamza; « Providing and Architecture Framework for Cyber-justice », Laws, Vol. 3, no 4, 2014, p. 721-743. LÉGER, Pierre-Majorique, LYLE, Derick, BABIN, Gilbert, CHARLAND, Patrick, PELLERIN, Robert; « Scope Management: A Core Information System Implementation Project Pedagogy », International Education Studies, Vol. 6, no 3, 2013, p. 55-65. CRONAN, Paul, LÉGER, Pierre-Majorique, ROBERT, Jacques, BABIN, Gilbert, CHARLAND, Patrick; « Comparing Objective Measures and Perceptions of Cognitive Learning in an ERP Simulation Game: A Research Note », Simulation & Gaming, Vol. 43, no 4, Août 2012, p. 461-480. LÉGER, Pierre-Majorique, CRONAN, Paul, CHARLAND, Patrick, PELLERIN, Robert, BABIN, Gilbert, ROBERT, Jacques; « Authentic OM problem solving in an ERP context », International Journal of Operations & Production Management, vol. 32, no 12, 2012, p. 1375-1394. PELLERIN, Robert, LEMIEUX, Andrée-Anne, HAJJI, Adnène, LÉGER, Pierre-Majorique, BABIN, Gilbert; « Analyzing and Optimizing an ERP Segmentation Pricing Strategy Under Diffusion Patterns », Information and Communication Technologies for the Advanced Enterprise, Vol. 2, no 2, 2012, p. 12-28.